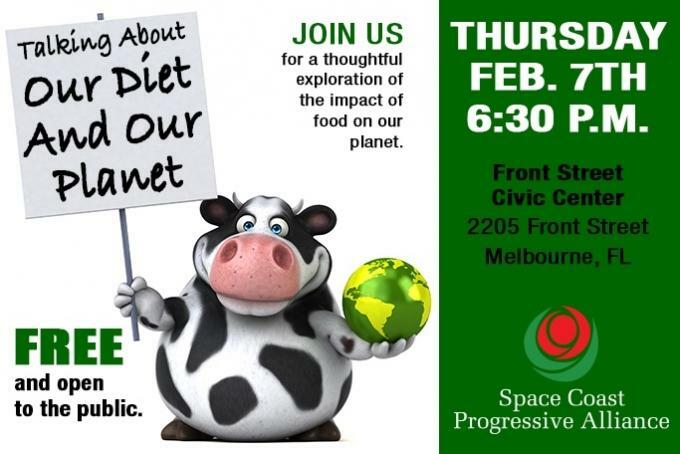 Phil Stasik, President of the Space Coast Progressive Alliance and Keenun Barley, founder of Plant Based Brevard talk about the Thursday night event. Most of us don't give a second thought to the impact of the foods that we eat, beyond taste or simple nutrition. The consequences are many and very powerful, indeed! It's not a topic that most of us like to face, but we will examine this with a fresh, non-judgmental attitude. It's time for a liberal helping of "foodie" facts! Thursday, Feb. 7th at 6:30 p.m. at the Front Street Civic Center, 2205 Front Street, Melbourne, FL. Keenun Barley on the plant-based journey she embarked on at the request of her 12-year-old daughter. Jarod Jacobs on overcoming MS symptoms through a vegetarian diet. Kayla Leaming on the animals we consume. Mike Leaming on the effect animal consumption has on the planet. The Leamings organize for Okeechobee Animal Save, Orlando Animal Save, Anonymous for the Voiceless Orlando, Florida Climate Save and Orlando Health Save. Together they host Vegan Campout USA.